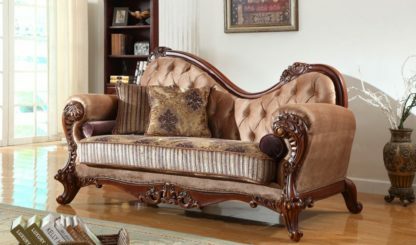 Perfect for your setting area, this traditional wood sofa furniture is sure to influence guests at your home. it is hand-carved by our skilled craftsman from Saharnpur. it is a high quality furniture from the house of Aarsun Woods improving the look of your home. The frame is made from hardwood with beautiful upholstery . The Sofa is supported by designer solid wood legs. The entire unit is finished in royal teak polish. The overall look gives your home a rich texture and Royal look. 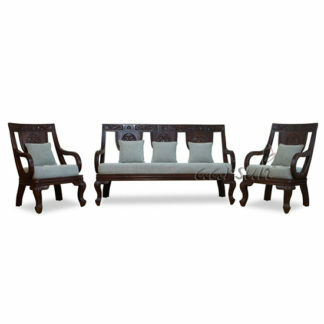 The Wooden sofa is quite large and can comfortably accommodate 3 people. Pair this sofa with its matching 3 seater, 2 seater and 1 seaters for a complete set of sofas to create your own seating arrangement.